What is power washing, anyway? It’s the method of using high-pressure water to remove stains, mold, loose paint, or grime from hard surfaces. And so it’s an excellent way of taking care of outdoor decking. Now, here’s the difference between power washing and pressure washing. Although these two terms are used interchangeably, there is a tiny distinction that makes the methods unique. In the case of power washing, hot water is used while pressure washers utilize water at normal temperatures. Which method is best for you? It depends on how often you take care of your deck and its overall condition. If there is chewing gum, grime, and over-accumulation of filth on your deck, prefer power washers with heated water. This is the most effective method if you want to remove stubborn stains or even mold. 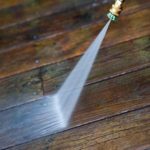 The purpose of power (or pressure) washing your cedar custom decks is to remove stains and dirt without using detergents. Here’s where it’s fair to say that your garden hose won’t do the job. Spraying water over your deck with a simple hose won’t have the results you expect. 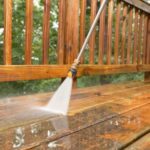 It also makes sense to point out that power washing the deck is one of the best preventive measures but whether or not you will need further maintenance tasks is subject to your deck’s condition. 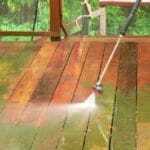 You should remember that power washing will remove loose paint but then you need to paint the deck. With all these things out of the way, let us continue with the main benefits of power washing decks. Since we just talked about painting decks, let us say that power washing will also smooth out the surface and thus prepare it for painting. As we have already mentioned, the high pressure of the water removes all kinds of stains and filth. But it will also remove mold and pollens which usually hide under the deck. With the contaminants removed, your allergies are eliminated too. The deck is not just clean but sterilized and this is important especially if you have toddlers and pets. It’s an effective method that won’t put your health at risk since no chemicals are used. It doesn’t cost much to hire a special deck contractor for power washing. With annual maintenance, the deck will be protected. Don’t forget that it’s exposed to elements all year around. And so power washing will keep it elegant and clean and thus will prolong its lifespan. It’s a great way to take care of wood fences too and all kinds of decks and thus increase the value of your home. Needless to say that spotless decks free of paint chips and mold improve the house’s curb appeal too. Power washing is not easy. It’s a matter of knowing how much water pressure to use on the deck. And not all decks are the same. Solid wood and composite decking need different water pressure. Still, it will depend on wood species. Softer woods might get ruined under the high water pressure. All the same, you need the deck clean (not damaged) and the best way to achieve that is by hiring a pro. Apart from that, this is one of the best maintenance tricks for long lasting decks whether they are the jewel of your patio or pool.